• Engineer: Engenheiro Walter Merlo. • Former Owner: naval constructor Comendador Giuseppe Martinelli. • Predio Martinelli was Sao Paulo's first skyscraper. In 1947 it lost its title to the nearby Edificio Altino Arantes. It also was the first high rise building in Brazil and in Latin America taller than 100 meters. • Former owner Italian Immigrant Martinelli and his wife lived in a four-story mansion on top of the building. It was only accessible by a private elevator and had a terrace and garden. • Cement for concrete was imported from Norway and Sweden. • The building hosted the first luminous advertisement in São Paulo, installed in 1929 and removed a few years later. • Due to financial difficulties in 1934, Martinelli sold the building to the Italian government. • In 1943, with Brazil joining World War II, all Italian properties were confiscated by the Brazilian government, including this building, renaming it Edifício América. After the war the original name was used again. • In 1992 the building became historical heritage by city hall. • In the 1950ies the building was invaded and occupied for years by poor families using the office building as a residence. • Between 1975-1979 the building was restored by Mayor Olavo Setúbal. 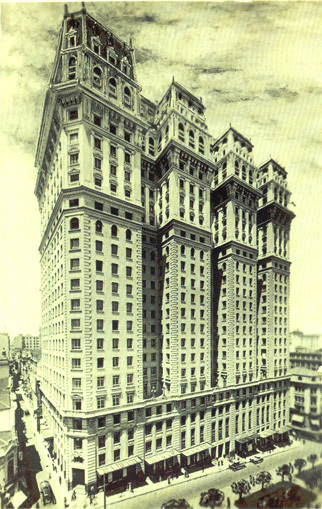 • Initially the project was a 12-stories building, the project was changed later to 14, 20, and finally 30 stories. Actually the building itself has 26-storeys while the Mansion atop has 4 floors. • Stories abound of the building being haunted by a ghost called "the blonde lady with no face", seen only in mirrors. • Several political parties had their headquarters in Building, the former PRP, PC, PI, then the UDN. The clubs also occupied their dependencies Palestra Itália, today the Palmeiras, the Portuguesa de Desportos and IT, now disappeared. Today has 'Secretarias Municipais de Habitação e Planejamento', Emurb, Cohab-SP and 'Sindicato dos Bancários de SP'.